A. Each digit will arrive at Cisco Unified Communications Manager in a SIP NOTIFY message as a KPML event, and Cisco Unified Communications Manager will extend the call as soon as the collected digits match the extension of the SCCP IP phone, bypassing class of service configuration on both IP phones. B. Each digit will arrive at Cisco Unified Communications Manager in a SIP NOTIFY message as a KPML event. When the collected digits match the extension of the SCCP IP phone, Cisco Unified Communications Manager will extend the call only if the class of service configuration on both phones permits this action. C. As soon as the user selects the Dial softkey, the SIP IP phone will forward all digits to Cisco Unified Communications Manager in a SIP INVITE message. Cisco Unified Communications Manager will extend the call as soon as the collected digits match the extension of the SCCP IP phone, bypassing class of service configuration on both IP phones. D. As soon as the user selects the Dial softkey, the SIP IP phone will forward all digits to Cisco Unified Communications Manager in a SIP INVITE message. Cisco Unified Communications Manager will extend the call only if class of service configuration on both phones permits this action. 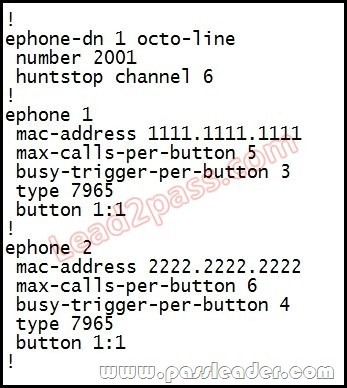 E. The SIP IP phone will wait for the interdigit timer to expire, and then send all digits to Cisco Unified Communications Manager in a SIP INVITE message. Cisco Unified Communications Manager will extend the call as soon as the collected digits match the extension of the SCCP IP phone, bypassing class of service configuration on both IP phones. The flex parameter allows the complexity to automatically adjust to either medium or high complexity depending on the needs of a call. For example, if a call uses the G.711 codec, the C5510 chipset automatically adjusts to the medium-complexity mode. However, if the call uses G.729, the C5510 chipset uses the high complexity mode.